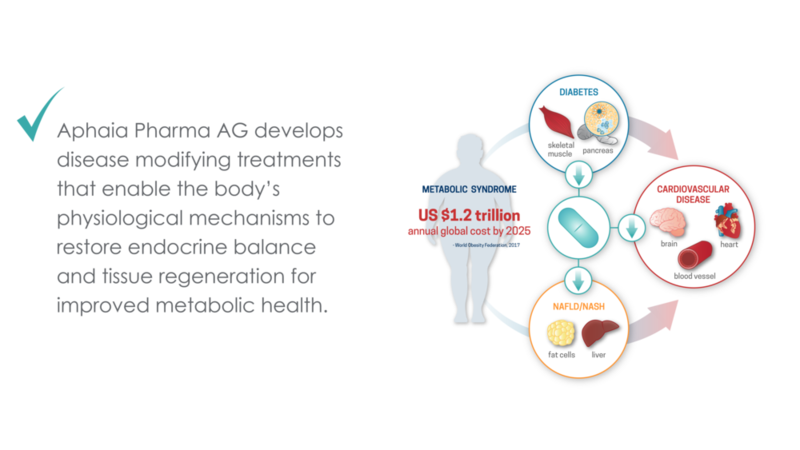 Aphaia Pharma AG is a clinical stage pharma company that has developed proprietary treatment methods targeting metabolic syndrome. Metabolic syndrome-associated clinical conditions like obesity, type 2 diabetes, fatty liver and heart disease have reached epidemic proportions, costing healthcare budgets across the world billions of dollars each year. Metabolic syndrome manifests as a cluster of symptoms and is associated with profound imbalances in an otherwise precisely tuned endocrine system within the GI tract. Aphaia develops disease modifying treatments that enable the body’s physiological mechanisms to restore endocrine balance and tissue regeneration for improved metabolic health. Aphaia's research program is run at select international sites and orchestrated by the main headquarters in Zug, Switzerland.